Well, hello there! So yeah, the whole "blogging more regularly" thing hasn't been working out as well as I had hoped. 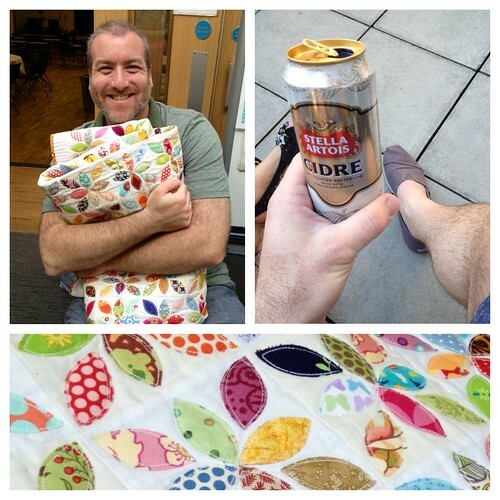 It doesn't mean I haven't been busy, though ... especially when it comes to sewing and quilting. But more on that soon. I was fortunate enough to spend an inspiring weekend in London last week for the second annual Fat Quarterly Community Retreat. You know, after last year, I didn't think it could get any better. I was wrong. I can't go much further without first talking about the amazing people I got to hang out with. 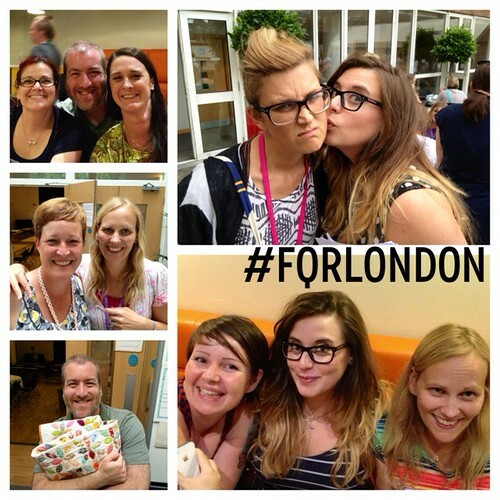 In the picture above you'll see some shots of Katy, Brioni, Laura Jane, Lu, Justine, Mandy, and Jenna. These ladies -- along with Lynne and Tacha and many others, of course -- made the weekend an even more incredible experience than I could have hoped for. See that tall stack of quilts in the top left? Those beautiful quilts were all made by attendees of the Fat Quarterly Community Retreat and donated to Siblings Together. Brilliant! I had the pleasure of teaching two classes this year. 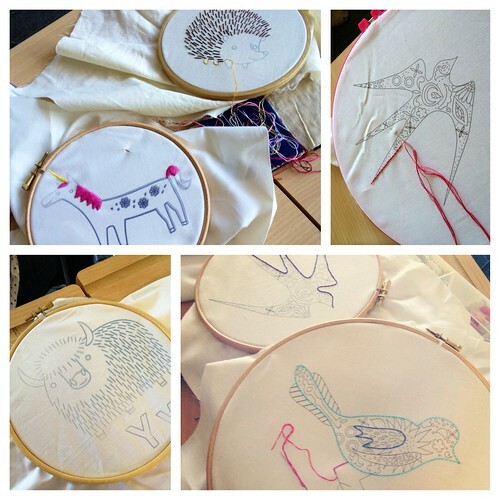 The first was a hand embroidery workshop in which I introduced some basic stitches that I like to use to a room full of eager crafters, both novice and experienced. The real fun, of course, came in the form of the many goodies I was able to round up and give away. Many thanks to Alyssa Thomas of Penguin & Fish, Alison Glass, and Spoonflower for their generous donations to my class. Alyssa provided several copies of her adorable iron-on transfer patterns (see the hedgehog, unicorn and yak above). Alison sent along a sneak peek of her newest Clover Sunshine embroidery patterns (see the birds and rabbit above). And since Alison's paper and iron-on patterns weren't available yet, I teamed up with my friends at Spoonflower to print the embroidery patterns directly onto some Kona cotton. Perfect! My second class was on blogging; i.e. how to create a successful blog and build your blog following. I must admit, I was extremely nervous about teaching this class -- I mean, have you seen the cobwebs and thick layer of dust that's been sitting on my blog for the past year? In the end, I pulled together a "Top 10" list of blog best practices that I think led to some very rich and meaningful conversations with the attendees of both sessions of my class. I'll post that Top 10 list soon but, in the meantime, Leila wrote a really nice blog post on the class that you can read here. I think that teaching that class has inspired me to come back and revisit this space. I hope I can stay a while. And while teaching the classes were most definitely highlights of the weekend, there were so many more: getting to meet and hang out with long-time online buddy Krista of Poppyprint; a lovely mid-day 4-mile run in Hyde Park; presiding over the fun swaps and pub quiz; hang-out time on the Baden-Powell House's fab terrace; late night clubbing with Justine and Laura Jane; pizza night; and our now-legendary final night dinner where we drink, laugh, drink, reminisce, and drink some more. From having never left the USA until last year's retreat to now having visited London 3 times in the past 12 months, it's beginning to feel like a second home. And I say "home" because I also feel like I have family there now. Can't wait to go back. It looks like FQR was an amazing event! I've seen those cute embroideries popping up on a few blogs lately and they are really adorable. Can't wait to read your Top 10 list, and I'm glad that session has tempted you back to this space. Sounds like good times. I enjoyed Leila's post on blogging as well. Yeah, I think we might just let you back next year :) Thanks for the great retreat! That is ironic :-) I miss bumping into you at David's since moving to Charlotte! I love all these photos of you surrounded by lovely ladies gazing at you adoringly! Maybe next year I'll get to take a class with you, but it was great to chat with you again this year. And I really loved the retreat - thank you! Hmmmmm....guess you didn't wear my nametag from last year! ;) That's ok...I'll cut you some slack this time....now stop being a stranger!! Hope you get a chance to post more often. . . love to see what you are up to. That's what I need - classes on blogging. Any place I can go to to learn more?? 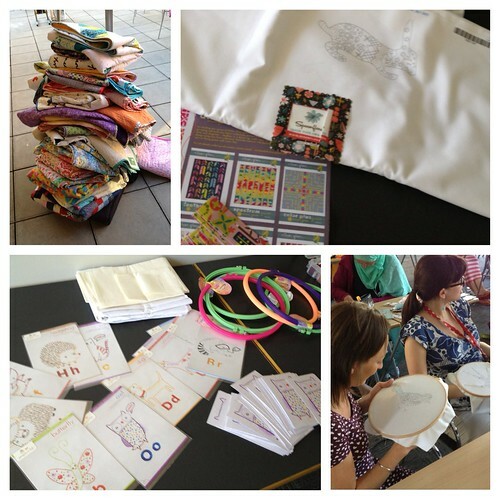 Loved your embroidery class, thank you! Sounds like the Retreat was a lot of fun. I do not remember anything that exciting happening when I lived in London. Those embroidery patterns are adorable! Isn't Europe fun? if they inspired such a thought provoking post as Leila's! 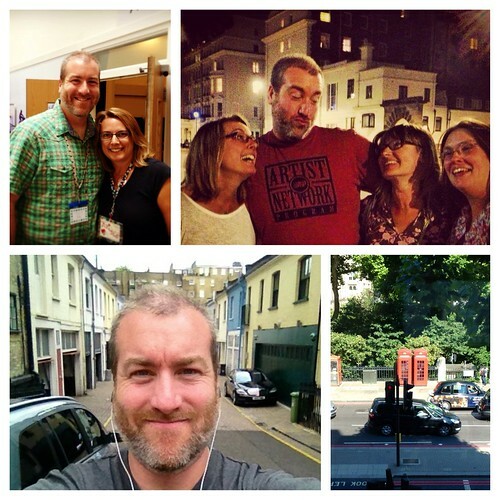 It looks like you had a great time at the retreat and in London. please tell me the name of the quilt you are holding! I am in love with the pattern and would love to make it! Supplements can help your dreams of having your own product come alive. Intermountain Private Label Supplement Manufacturer offers a wide variety of custom formulation services including liquids, capsules, sprays, powders, and more.